Rainy day in the Bay? Why not check out what's up at PE Museum at the Bayworld Complex. 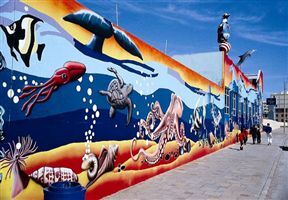 Situated on the main beachfront, it delivers a feast of education and entertainment to thousands of visitors each year. March the kids straight to the life-sized reconstruction of the giant prehistoric dinosaur known as Algoasaurus that once lived here. Another leviathan for your pipsqueaks to gawk at is the 15 metre skeleton of the last Southern right whale harpooned in Nelson Mandela Bay. Wannabee pirates will dig the replica of the Dias Cross and a five metre bronze cannon dated 1640, salvaged from a Portuguese galleon wrecked near Port Elizabeth. The Port Elizabeth Museum is a wonderful blend of cultural and natural history and is the third oldest in South Africa. Displays include the Dinosaur, Marine, Bird, Maritime History, Costume and Local History Halls, as well as a Curiosity Corner, Xhosa Beadwork Gallery and the First People of the Bay. Diverse temporary exhibits in the fields of natural science, archaeology and geology regularly spice up what’s on offer. Definitely worth a visit! Open 09:00 – 16:30 every day of the year, except on Christmas Day, 25 December. Port Elizabeth Museum is 1.2km from the centre of Humewood , the nearest airport 4.4km (Port Elizabeth Airport).